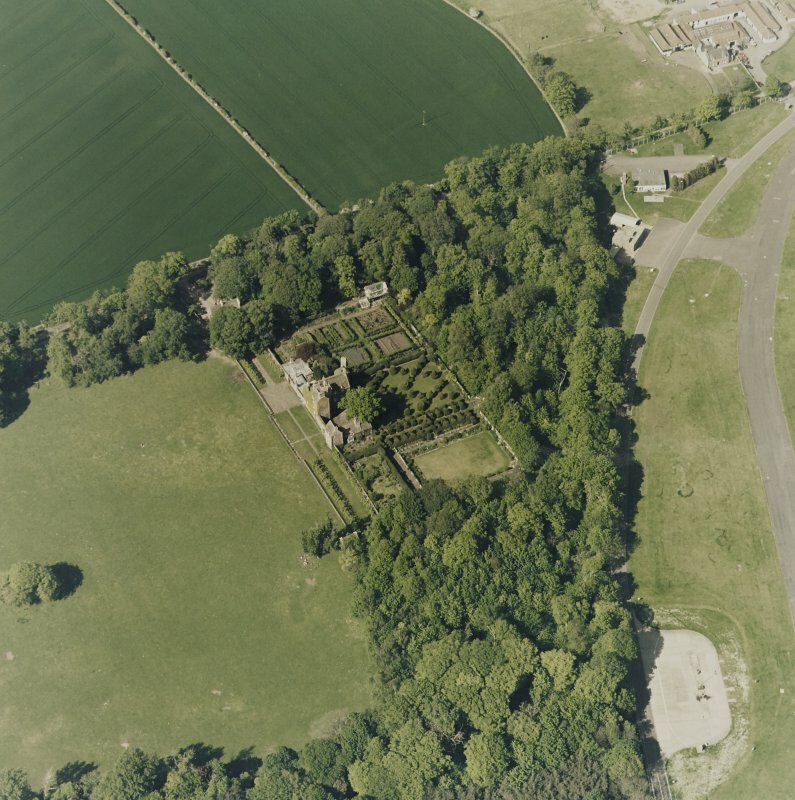 Aerial view of Earlshall country house, formal garden and dovecot, taken from the SW.
Aerial view of Earlshall country house, formal garden and dovecot, taken from the NW. 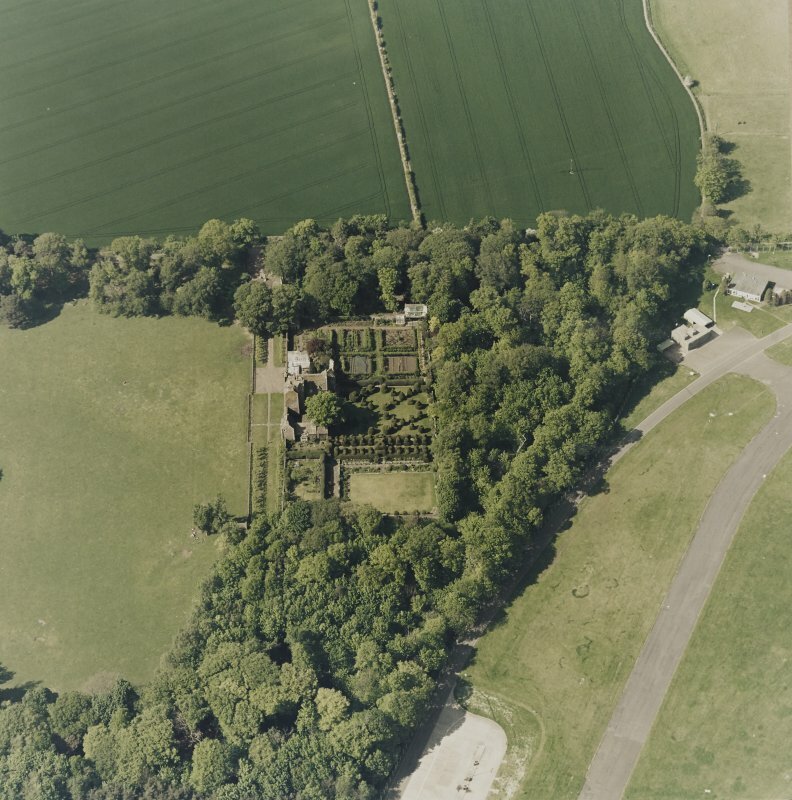 Aerial view of Earlshall country house, formal garden and dovecot, taken from the NNW. 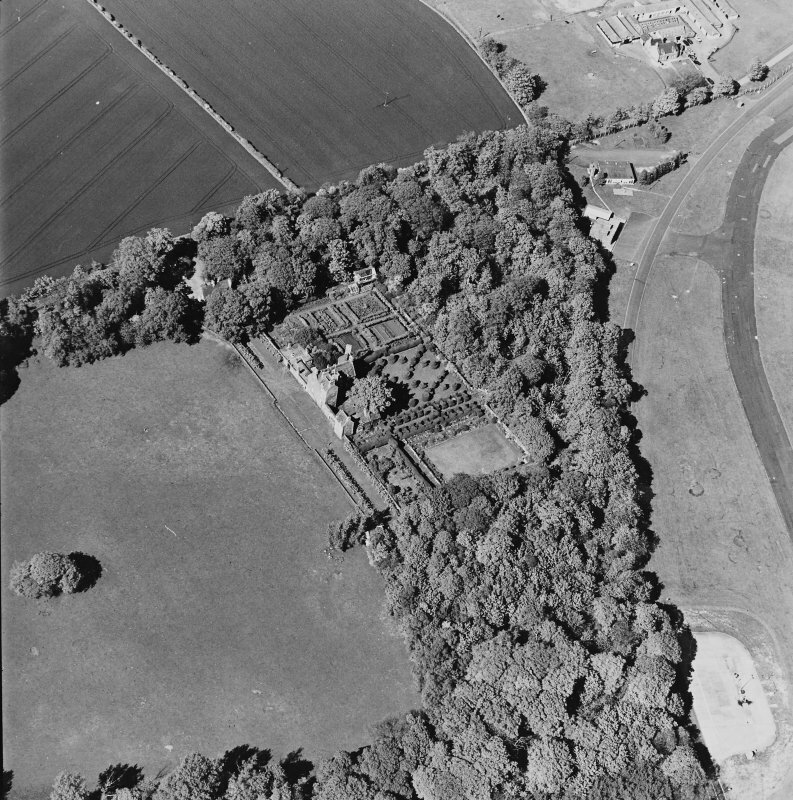 Aerial view of Earlshall country house, formal garden and dovecot, taken from the NE. 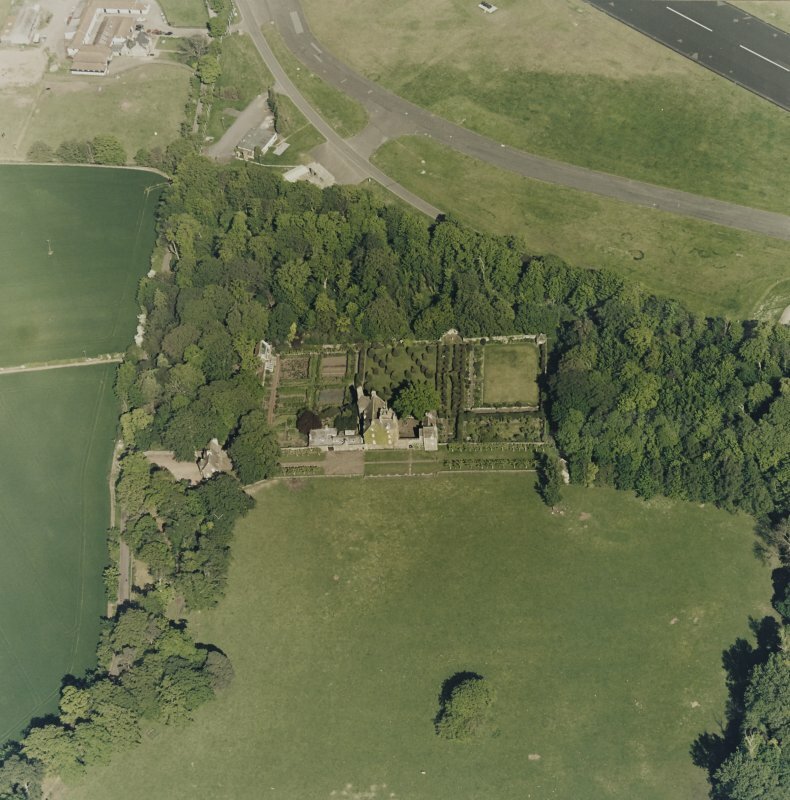 Aerial view of Earlshall country house, formal garden and dovecot, taken from the N.
Aerial view of Earlshall country house, formal garden and dovecot, taken from the S.
Aerial view of Earlshall country house, formal garden and dovecot, taken from the SSW. 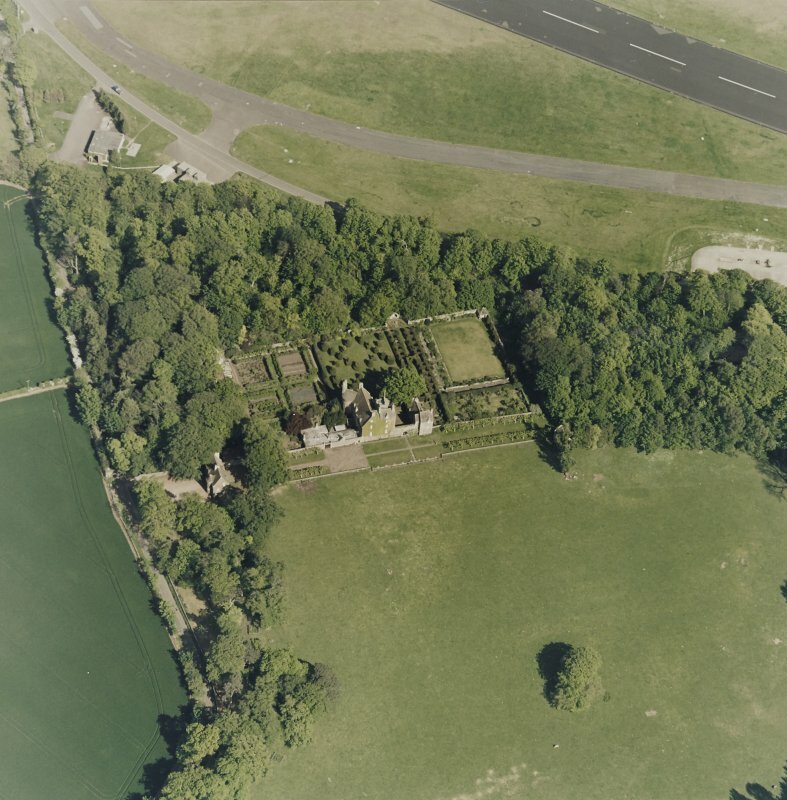 Aerial view of Earlshall country house, formal garden and dovecot, taken from the W.
Oblique aerial view of Earlshall country house, formal garden and dovecot, taken from the W. Scanned image of D 5946 CN. 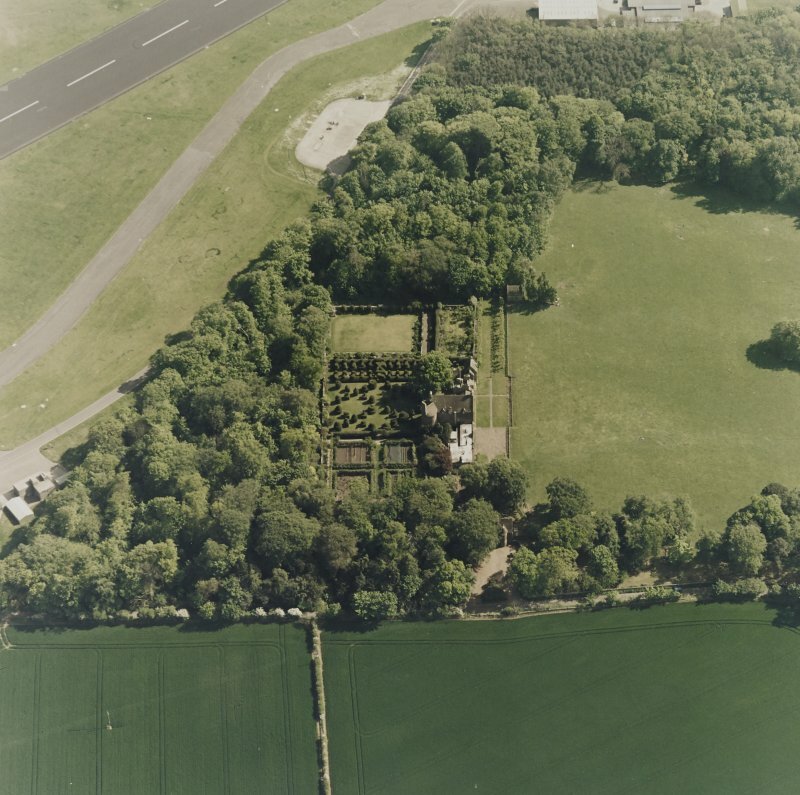 Aerial view of Earlshall country house, formal garden and dovecot, taken from the SSE. 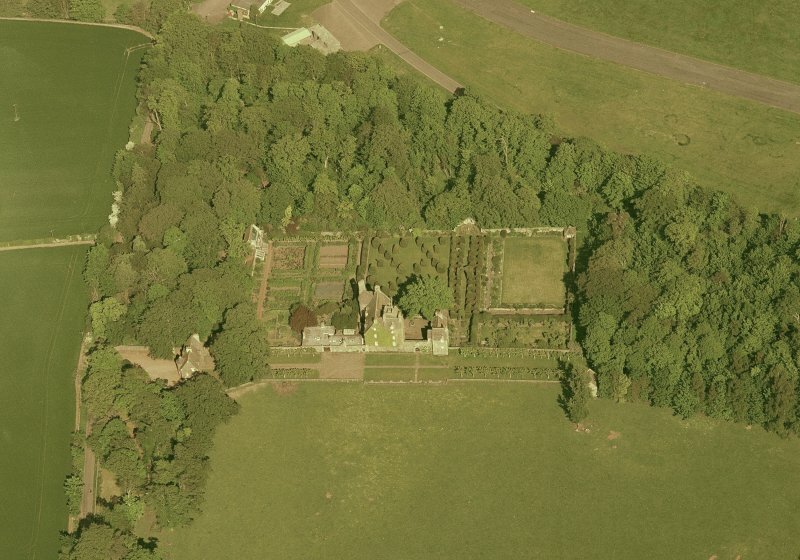 Aerial view of Earlshall country house, formal garden and dovecot, taken from the WSW. Aerial view of Earlshall country house, formal garden and dovecot, taken from the SE. 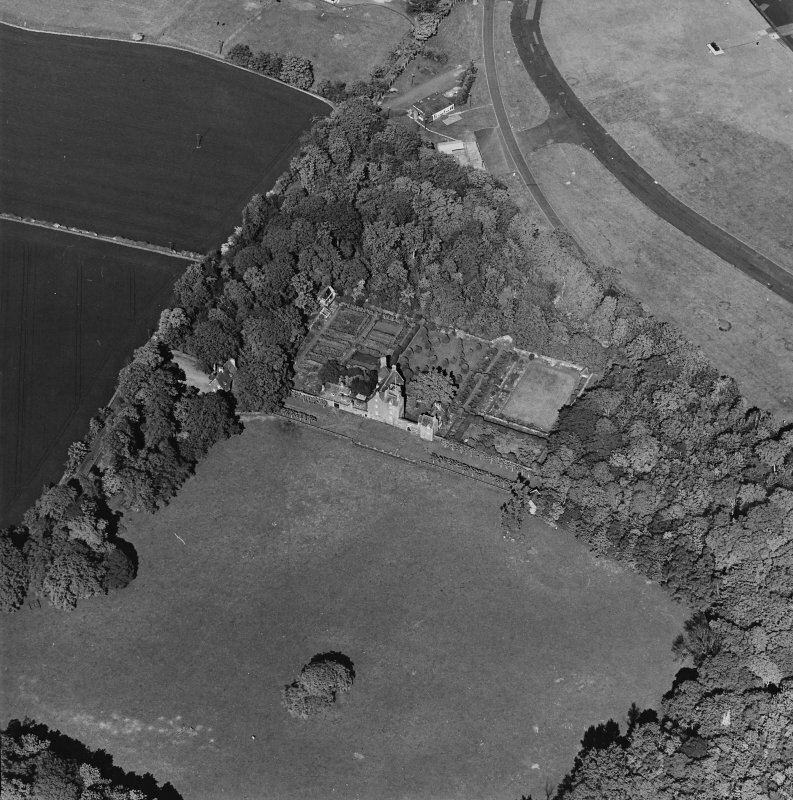 Oblique aerial view of Earlshall country house, formal garden and dovecot, taken from the W.
Dovecot, Earlshall, dated 1599. 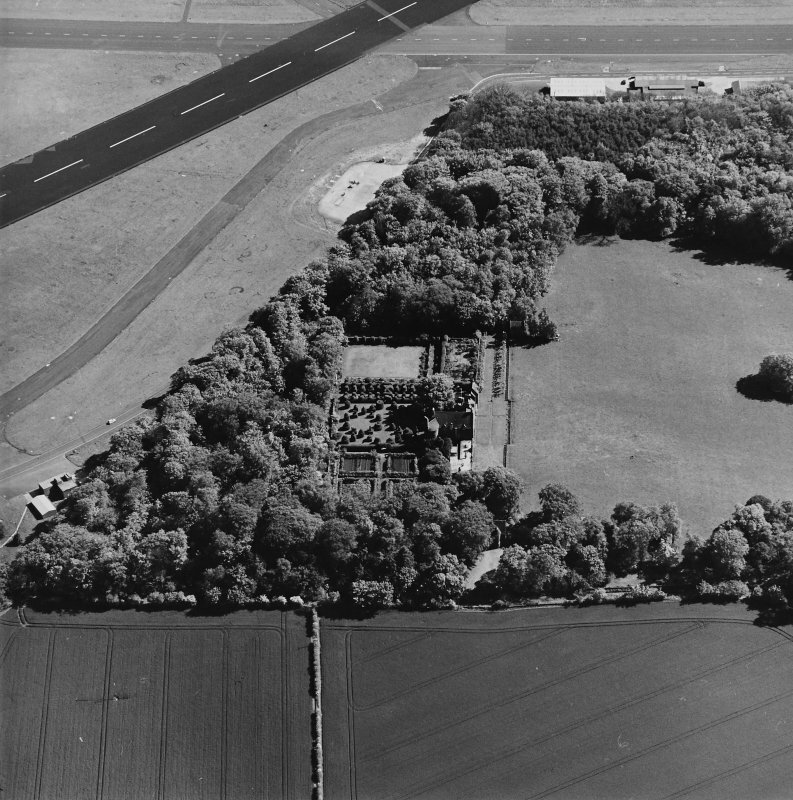 "Some 70 yards SSW of the courtyard of Earlshall is a dovecot of unusual type. 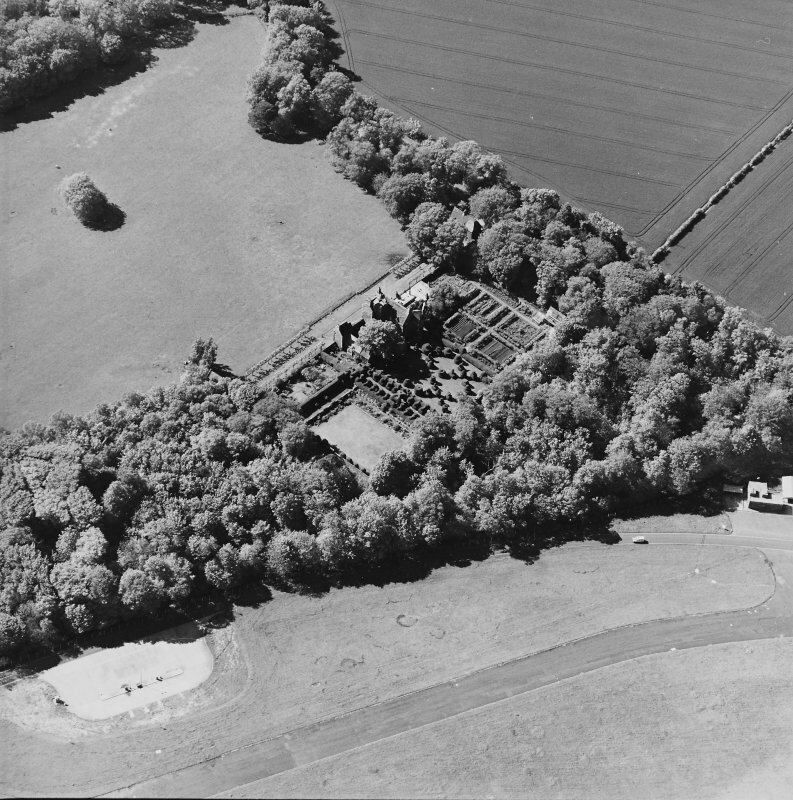 It is built of rubble, with a single string-course...and is oblong on plan, measuring 16'5" x 22'4" externally. 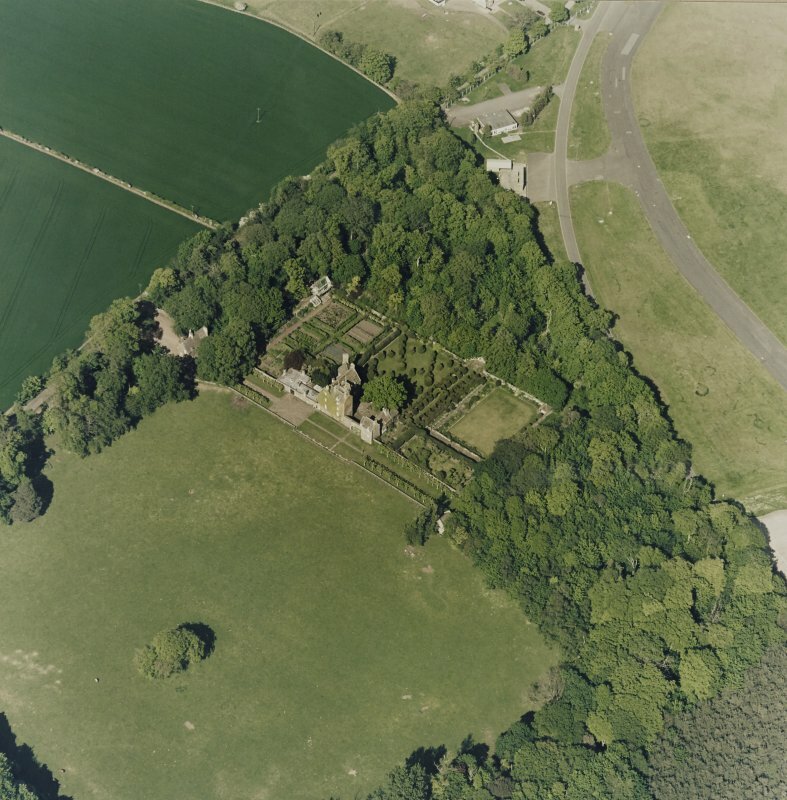 There are two storeys, each with a window, and the gabels are skewed. The entrance to the lower part has on each side an angled opening with a stone shelf, through which apparently the birds entered. 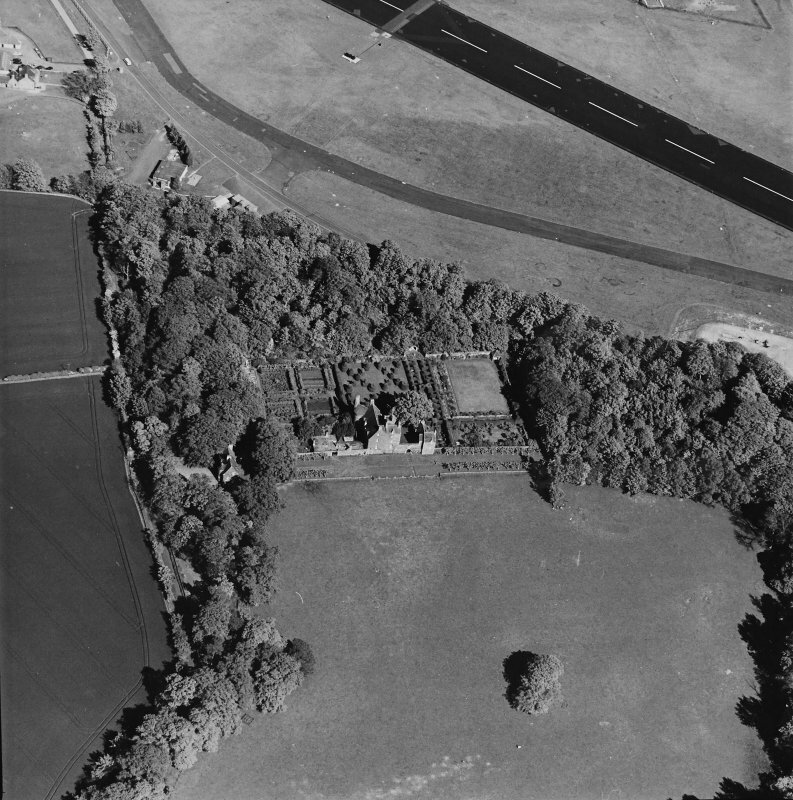 A small panel set over the lower entrance bears initials A.B. and the date 1599. 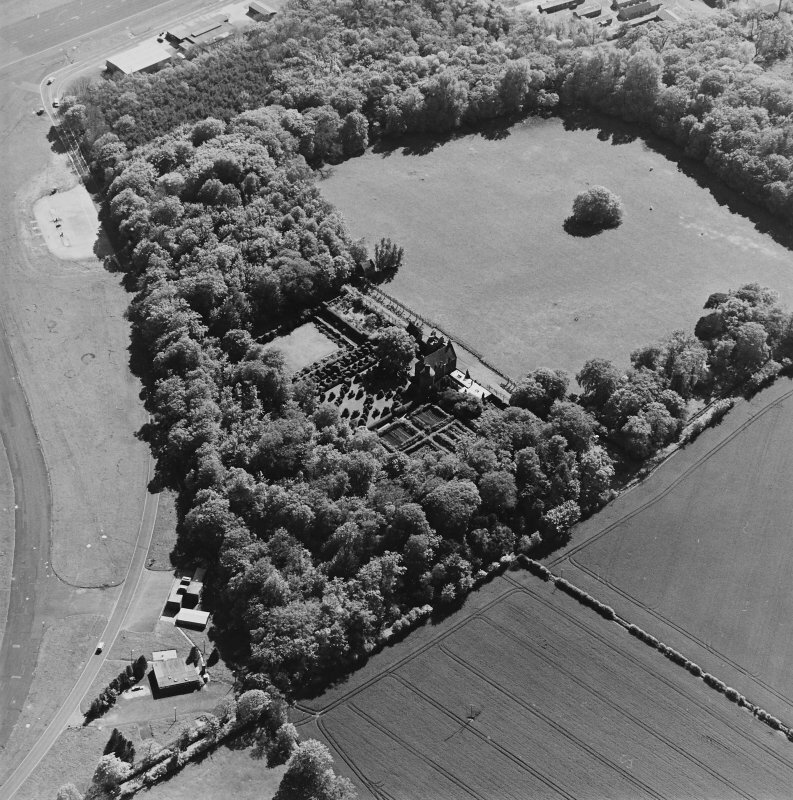 The dovecot is in good condition, and is as described above. 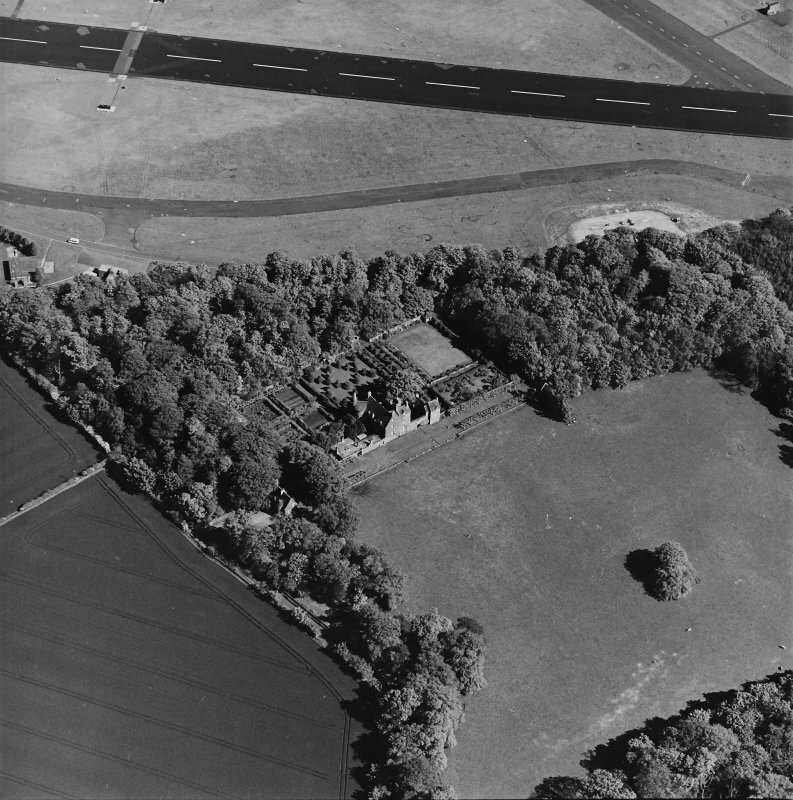 Visited by OS (RDL) 5 June 1964.